Ryoichi "Rio" Kakui (born October 25, 1968) was born in Osaka, raised in Nara Prefecture, and now lives in Akihabara, Tokyo, Japan. Once a student at Department of Economics, Faculty of Economics at Sophia University, he had earned all university credits by his junior year and later became one of the attendants in a seminar supervised by Professor Toshimi Tanaka, who later became the founding chairman of the Japan Academic Society of Direct Marketing. After his graduation, he moved to the United States of America and studied in Golden Gate University where he obtained the Marketing MBA. After his return to Japan, he joined Funai Consulting Inc. and worked as a consultant for retailers. Later he entered Koki Group, a logistics company, and served as a logistics consultant. 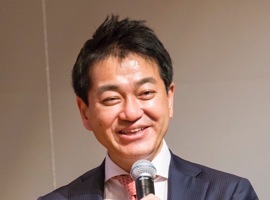 One of the most successful project during his career at Koki Group was a full launch of a logistics center for a company listed on the first section of the Tokyo Stock Exchange under the scheme of gainsharing (a pay-per-success model of business process outsourcing), which was the first of its kind in Japan. On February 14, 2000 he founded a company named e-LogiT Co., ltd. and has become its first Chief Executive Officer. e-LogiT is a logistics service provider focused and specialized in the eCommerce business and currently serves more than 200 contractee companies which number ranks No. 1 among its competitors in addition to provision of other business services including logistics consulting, in-house education, and on-site training programs. He is also the owner and director of a company named lightvan co. ltd., a service representative focused on selling goods for musicians and artists. In 2015, he launched a company Uketoru Co., Ltd., an app developer focused on developing life-hack apps for stopping re-deliveries of purchased goods; he also co-founded a logistics IT company called SHIPPOP in Thailand with Pawoot (Pom) Pongvitayapanu who is the founder of Tarad.com, the biggest eCommerce retailer in Thailand. As of Today, he has published 22 books which are now sold in many different languages including Japanese, English, traditional and simplified Chinese, and Korean. Two of his previous publications, "Butsuryu ga Wakaru" and "Omunityaneru Senryaku", both published by Nikkei Publishing Inc. were translated into English under the title of "Strategic Logistics in Japan" and "Omni-Channel Strategy in U.S. and Japan". Copyright ©2000-2018 e-LogiT.com All rights reserved.